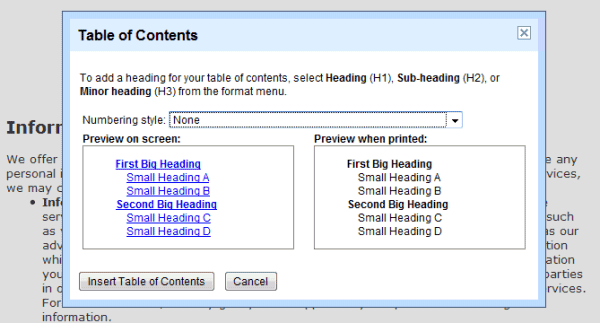 Basic features like table of contents, footnotes or thesaurus are still missing from Google Docs. Some of the features are already implemented and they're ready to be added to the interface. You should see a dialog that lets you choose the numbering style. Hopefully, these features will soon be added in the interface. Not sure why, but when I paste one of those lines into the address bar and hit "enter", nothing happen, except that when I try the table of contents, it downloads the doc as a pdf. I'm using FF3. Otherwise, it will be great when these features get into the interface. And, just curious: how did you figure this out? Do you have to actually read the code, or do you find documentation? Just wondering . . .
You'd need to sort thru the code. Then I disabled gears (offline access to google docs) and tried again, and it worked. So I suppose this only works - at least for now - with the online version of google docs ; maybe that's why it doesn't appear in the menus ? Yes, it works with disabled of gears. Thanks for noticing that. I updated the post. Generating a Table of contents was something I really missed in Google Docs ; glad it's becoming possible ! I struggled for some time to get this to work until I discovered it only works if you have English US set"